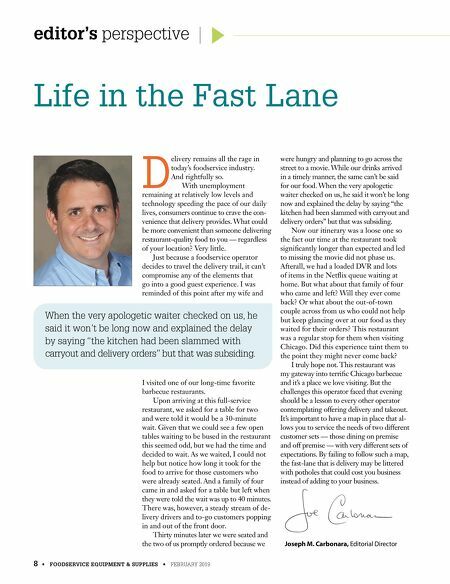 editor's perspective 8 • FOODSERVICE EQUIPMENT & SUPPLIES • FEBRUARY 2019 Life in the Fast Lane When the very apologetic waiter checked on us, he said it won't be long now and explained the delay by saying "the kitchen had been slammed with carryout and delivery orders" but that was subsiding. 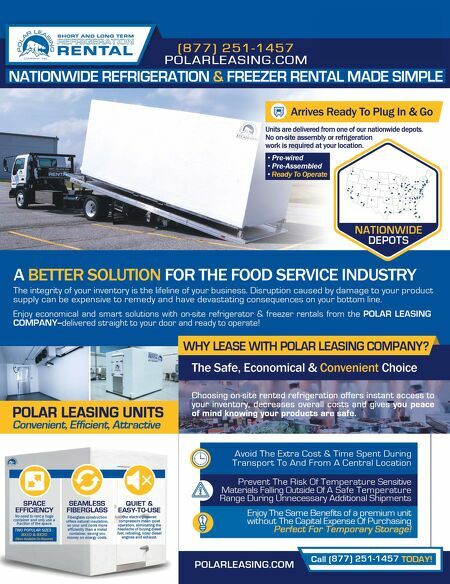 Joseph M. Carbonara, Editorial Director D elivery remains all the rage in today's foodservice industry. And rightfully so. With unemployment remaining at relatively low levels and technology speeding the pace of our daily lives, consumers continue to crave the con- venience that delivery provides. What could be more convenient than someone delivering restaurant-quality food to you — regardless of your location? Very little. Just because a foodservice operator decides to travel the delivery trail, it can't compromise any of the elements that go into a good guest experience. I was reminded of this point after my wife and I visited one of our long-time favorite barbecue restaurants. Upon arriving at this full-service restaurant, we asked for a table for two and were told it would be a 30-minute wait. Given that we could see a few open tables waiting to be bused in the restaurant this seemed odd, but we had the time and decided to wait. As we waited, I could not help but notice how long it took for the food to arrive for those customers who were already seated. And a family of four came in and asked for a table but left when they were told the wait was up to 40 minutes. There was, however, a steady stream of de- livery drivers and to-go customers popping in and out of the front door. Thirty minutes later we were seated and the two of us promptly ordered because we were hungry and planning to go across the street to a movie. While our drinks arrived in a timely manner, the same can't be said for our food. When the very apologetic waiter checked on us, he said it won't be long now and explained the delay by saying "the kitchen had been slammed with carryout and delivery orders" but that was subsiding. Now our itinerary was a loose one so the fact our time at the restaurant took significantly longer than expected and led to missing the movie did not phase us. Afterall, we had a loaded DVR and lots of items in the Netflix queue waiting at home. But what about that family of four who came and left? Will they ever come back? Or what about the out-of-town couple across from us who could not help but keep glancing over at our food as they waited for their orders? This restaurant was a regular stop for them when visiting Chicago. Did this experience taint them to the point they might never come back? I truly hope not. This restaurant was my gateway into terrific Chicago barbecue and it's a place we love visiting. But the challenges this operator faced that evening should be a lesson to every other operator contemplating offering delivery and takeout. It's important to have a map in place that al- lows you to service the needs of two different customer sets — those dining on premise and off premise — with very different sets of expectations. By failing to follow such a map, the fast-lane that is delivery may be littered with potholes that could cost you business instead of adding to your business.